A quick word from the experts..
SEMrush was recently rated the #1 keyword research tool by 105 search marketing experts, and the #1 SEO tool by 143 others. Summary: SEMrush is not just another keyword tool. I use it every day for personal and client search marketing projects. It allows you to get an (almost unfair) behind-the-scenes look at your top performing competitors and use the insights to build profitable campaigns right from the beginning. No more guesswork. Make decisions with data. Find profitable keyword opportunities, pinpoint high-converting ad and landing page copy, dissect competitor content strategies, audit backlink profiles, identify new site monetization opportunities, track metrics in real-time...and a lot more. Follow along with the review and tutorial. There are no gaps here. SEMrush provides real-time access to an unbelievable amount of organic and paid search data. This is a monster 13,000+ word review. To make it easier to navigate, I have included jump links to each of the key sections below. The review is broken out into 4 broad categories - organic research, paid analysis, backlinks and reporting. Feel free to jump around to the topics of most interest to you. When setting up any type of online marketing campaign a LOT of marketers and business owners try to "reinvent the wheel". They spend countless hours and money trying to come up with the “next big idea” that will blow their competitors out of the water. (At least not right in the beginning). Instead, use data to plan, build and launch marketing campaigns you know have a fighting chance of success (and profitability). Find out what is working for your top competitors and do MORE of that. But, very few people do it. By first looking at your top-performing competitors you’ll be able to quickly spot gaps in your online marketing strategy, eliminate the guesswork and start with a campaign that has a proven track record. This process doesn’t have to be time consuming or a huge draw on your wallet. SEMrush will give you a powerful behind-the-scenes look at what is and is not working for your top competitors....FAST! Armed with this knowledge, you'll be using data (not guesswork) to make strategic marketing decisions and deliver results for your boss or business much faster! In this SEMrush review I’m going to show you the tool's best features, its weaknesses, and provide an actionable step-by-step game plan for you to quickly get up and running with the the tool to dissect your online competition and model their success. How to monitor SERP volatility with "Sensor"
...and that's just the beginning. If you're a marketer, agency, business owner or someone serious about building profitable online marketing campaigns, grab a 30-day free PRO trial and follow along with the review. This post provides the most comprehensive SEMrush review (13,000+ words) you’ll find anywhere on the web. I’ve broken it down into easy-to-navigate categories below. Each section of this review will highlight a product feature, walk you step-by-step through how to use it, and provide an action item for immediate implementation. Before starting any type of competitor analysis, it’s a always a good idea to first look at how you’re currently performing across organic and paid search channels. This report will give you high-level benchmark data in a number of areas. Set a date range for the report and download it as a PDF. Use the data on the overview dashboard to establish some baseline benchmark metrics. How much organic traffic are you getting? How much paid traffic (if any)? How many keywords do you have ranking in the top three search results? Put this data into a spreadsheet. You can return to these metrics periodically and see if you’re SEO and PPC efforts are proving effective. The next step is to identify your top organic competitors. Enter your domain into the search bar and navigate to the “Domain Analytics” >> “Competitors” tab. You will see a competitor positioning map highlighting the top organic search competitors. In this example, we can see that GrooveHQ is a top competitor in terms of both search traffic and number of keywords ranking in the top 100 search results. Click on the bubble and you’ll be taken to a dashboard covering different organic keyword, paid ad and backlink data (more on that later). Now it’s time to dive a little deeper. Scroll down from the competitor positioning map and you’ll find the organic competitors table. You can see in the table we’ve instantly been able to uncover 13,776 potential competitors. These are domains your site is competing with in Google’s top 100 organic search results. Now, no one has time to analyze over 13,000 competitors, but can you imagine how long it would take to go out to Google and manually sift through the SERPs and put together a list this size? A LOT longer than the three seconds it just took you. Time is money, and you just saved a bunch of it. Pay close attention to the following metrics in the table. Competition Level: the larger the number of common keywords, the greater the level of perceived competition. Common Keywords: how many of the same keywords your competitor is ranking for in the top 100 search results. SE Keywords: the number of keywords bringing visitors to a website via Google’s top 100 organic search results. These metrics will reveal your top organic search competitors. I would recommend starting with the Common Keywords column. This will filter out the domains currently ranking in the top 100 search results for the same keywords you are ranking for. The more common keywords, the stronger the competition. Select a domain from the Competitors table that has a high number of common keywords. This is the first competitor you'll be analyzing in greater detail. Once you've selected the domain of a top competitor, navigate to the Organic research >> Positions report. You'll see a high-level overview of the competitor's organic search performance, including the number of keywords the domain is currently ranking for in Google's top 100 search results, the amount of organic traffic the site receives each month and the estimated cost of the organic keywords if you were to bid on them in AdWords. You can view the data for both mobile and desktop devices. These will tell you if the number of keywords and amount of organic search traffic your competitor is receiving is increasing or decreasing over time. A graph that is trending up and to the right (like the one shown above) indicates a successful SEO campaign is in place. Dig deeper. It's time to see which specific keywords are driving the most organic traffic to your competitor's website. URL: Which content is ranking for the given keyword. Traffic Percentage: The percentage of traffic each keyword drives to the website. Competition: This is on a sliding scale from 0 to 1. It can help you determine if the keyword is a realistic target in your search campaign. SERP: Get a real-time snapshot of the SERP and assess the competitiveness for each keyword. I know that Helpscout gets around 59,900 organic visits a month. I can calculate Helpscout is getting roughly 8,642 monthly organic visits from this single keyword! If this search phrase is related to my business, I'll definitely want to dive deeper and find out which content they are using to rank for it (and see if I can compete for some of that traffic). Export the keywords you are currently ranking for, as well as the keywords of your competitor and import them into a master excel spreadsheet. Remove any duplicates so you are left with a list of keywords your competitor is ranking for, but you are not. Sort the list by search volume and competition to find new keyword targets to incorporate into your content strategy. A “keyword gap” analysis will tell you where you fall short in comparison to your competitors. How? By uncovering keywords your competitors rank for, but you don’t. This will uncover “content gaps” and give ideas for keywords you could be targeting, and could most likely rank for, too. Go to the Domain vs. Domain report. You should now see space to enter up to 5 domains for comparison. Basically, you’re going to need to enter up to 4 competitors, followed by your own website. If I was doing a keyword gap analysis for my own website (robbierichards.com), I could enter ahrefs.com, backlinko.com, and webris.org as competitors, followed by my own website. IMPORTANT: You MUST enter your competitor's domains first, with your own domain last on the list. You may notice there’s a venn diagram icon between each of these domains. This allows you to choose exactly which keywords you want SEMRush to kick back. This is some seriously powerful stuff. Why? Because if multiple competitors are targeting and ranking for certain keywords, it’s highly likely you could also rank for them. But, what if you wanted to see keywords that ANY (not ALL) of your competitors rank for? You’ll now see keywords that one (or more) of your competitors rank for, yet you don’t. This is actually pretty useless information. What you really want to see is the keywords competitors are ranking in the top 10 for. Here, we can now see a few high volume search terms where at least one competitor is ranking in the top 10. This report shows all the pages your competitor has ranking in the top 100 Google search results. It also provides an estimation for the amount of traffic brought to the page from organic search, all the keywords the page is ranking for, as well as additional backlink and AdWords data. Above, you can see that Helpscout's "customer service skills" post is ranking for 2250 keywords and accounts for almost 40% of the site's organic traffic. Scrolling further down the table we can quickly see all the different customer service topics Helpscout is using to capture loads of top-of-the-funnel organic search traffic. Enter your competitor's domain into Semrush and navigate to the Pages report. Look over the different posts and pages generating the most organic traffic. You'll be able to see all the different long tail keyword variations the post/page is ranking for, along with search volume, position and percentage of traffic. Export the list of keywords for manual review and sorting. These are all variations you'll want to consider integrating into key on-page elements - title tags, headings, body copy, alt text, URL. What type of content are they using? In this case, Helpscout is using a 15-point long form list post and targeting the keyword "customer service skills" in the URL, Title tag, H1 tags and body copy. How is your competitor optimizing on-page SEO for the target keyword? You'll want to take it a step further. Scroll through and take note of the different sites competing for the search term. Install the Mozbar chrome extension to get a quick view of each site's domain and page authority. Note: Avoid targeting keywords where the competitors have insanely high domain and page authority. These include big names brands like Forbes, Inc, YouTube, and .Gov sites. If there are a bunch of websites with significantly higher domain authority, it might not be a keyword you want to target just yet. Generally, go after keywords where there is at least 1-2 sites with comparable domain and page authority already ranking on the first page. This is usually a good sign. If the competition isn't too high, build out a piece of content that will blow your competition out of the water. Use the exported list of keywords to prioritize which variations you'll be targeting in the post content. There is a reason 60 online marketing experts rated Semrush the #1 keyword research tool. It allows you to quickly find all the common keywords you and your competitors are ranking for, as well as loads of new keyword opportunities your competitors are targeting but you may have overlooked. In this section we're going to find all of these keywords and then look at ways to expand your keyword list by mining dozens of long tail variations. But first, why are long tail keywords important? Long tail keywords are longer, more specific keyword variations. They contain at least 3-4 keywords and are likely searched for when the user is closer to the bottom of the funnel. Long tail keywords usually have much less competition compared to the more popular "head" terms, which means they are usually easier to rank and have a lower CPC. In fact, long tail keywords account for roughly 70% of all online searches. The metrics can be filtered for both mobile and desktop traffic. This is where you'll be able to find dozens of great long tail keyword variations you might not have ever considered targeting in your content. This table contains 272 queries containing the phrase "customer service skills“. Export the "Phrase Match" report and sort the data by search volume and competition. Look for all the long tail variations you can target within a single post. "How to improve customer service skills"
All have decent search volume and could be targeted within a single post. Helpscout ranks #1 for each of the long tail variations, driving thousands of additional visitors to their site every month. You can scale this process easily by clicking on a keyword and drilling further into the report. Instantly we are presented with several other long tail keyword variations we could incorporate into an article about customer service skills training. Drilling into each of these keywords could return numerous other keyword opportunities with even larger search volume. Click to view the full report. Look at the search volume, CPC and SERP source for each of the keywords. Click to view the the full report. The key hear is to try and find relevant keywords to add to your growing list. You can get extremely granular. Sort the list by search volume. For this example, we’ll export and sort the keywords, deleting any with a monthly search volume below 100. Add these terms to your master keyword list and remove any duplicates. Now, only those related terms not already on your list are added. Search for a commercial intent keyword. For example, “buy underwater boat lights”. Click 2-3 levels deep into the related search terms report to find loads of long-tail variations. These are the search terms you’ll want to be sprinkling throughout your content in order to maximize the topical relevancy (more variations = more clues = stronger relevancy) and ranking potential for those pages. Imagine if there was a tool that allowed you to find up to 2 million related long-tail keywords (from a single seed keyword) at the touch of a button. Enter the Keyword Magic Tool. Yep, that’s 111 K+ related keywords. Pretty impressive, right? But, here’s the problem: not all of these keywords will be relevant to your business. Luckily, though, there are a bunch of powerful filters that will allow you to uncover long-tail keywords that DO work for your business. We’re talking filtering by specific search intent (e.g. commercial, informational, etc. ), low keyword difficulty, and much more. Let’s imagine, for example, that you've just started a new weight loss blog and you’re looking for new blog post topics / ideas. However, you have no idea what kind of problems people in this niche have. If you want to get a little more granular, use the “topics” menu on the left-hand side. This essentially groups all keywords into sub-topics (it’s a bit like “ad groups” in AdWords), so you can narrow them down with a single click. For example, let’s say we wanted to write something about “protein” - we could simply click the “protein” group on the menu to filter the results. NOTE: If you don’t see a related KW/topic on the list, click “advanced filters” and add a KW to the “include keywords” area - this will restrict the results so you only see topics containing that KW. But still, some of these KWs have a high KD score, so let’s add a filter to show only easy to rank for KWs under 60. Any KWs that look promising can be added to Keyword Analyzer with a few clicks - this allows you to take a deeper look at the keywords and make sure they’re worth targeting. From our list of keywords, I’d say “how to use shakeology for weight loss” looks promising. Let’s analyse it further in Keywords Analyzer. Looking at the competition, it looks pretty poor, so I’d say this would be a decent KW to target. It’s also a KW we would likely never have found using traditional KW research methods - I really recommend giving this tool a try. Go to Organic Research > Positions. NOTE: This is my go-to report when I begin keyword research, as it always uncovers some GREAT keywords. However, this report also tends to uncover a LOT of keywords (25K+, in this example) and, usually, not all of these will be keywords you actually want to target. The Export manager lets you to create a custom .csv export containing only the keywords you choose. Plus, you can combine the keywords you find within multiple SEMRush reports into one monster .csv. I can already see that Brian Dean (aka. Backlinko) is competing with me for this term, and his keyword research guide is ranking for some pretty sweet keywords (see screenshot above). I’ll begin by checking any keywords that look good from the Positions Report. Cool, that’s a few good keywords in the bag! But, I know that I could uncover even more great keywords using some of the other reports within SEMRush. However, I don’t want to lose the keywords I’ve already found. Solution: hit the “Add to Export Manager” button. You should now see the number next to the button change to reflect the number of keywords you’ve added. OK, let’s see if we can uncover more keywords in some other reports. I’ll start by checking out the other keywords Brian’s keyword research post ranks for under the “URL” report. Again, I’ll check the ones I want and add them to the Export Manager. There’s no need to add these again! At any point, you can take a live look at the keywords you’ve added to the Export Manager by clicking the number next to the “Add to Export Manager Button”. Looking at the keywords I’ve collected in Export Manager so far, it looks as though “keyword research tool” is the best fit so far. Let’s take a look at other Related and Phrase Match keywords for the keyword “best keyword tool” in the Keyword Analytics report. Wow, there are plenty of great keywords here — let’s add these to the Export Manager, too. Looking at the Export Manager again, it looks like I’ve got a pretty big list of keywords now. I think it’s time to export! To do this, open the Export Manager and hit the Export button. This will export all the keywords you’ve added — from the various reports — into one neat .csv file. So far you've managed to identify your top organic search competitors, find all the keywords they rank for, identifed their top performing content, and unearthed loads of potential long tail keywords to target. In this step you're going to find all the keywords you and your top competitors are ranking for, find where they are beating you, and identify key areas for improvement (and growth). View the specific ranking positions for each of the keywords, along with the average monthly search volume, CPC and competitive density metrics. The keywords with high average monthly search volume, CPC and competitive density are GOLDMINES. Higher search volume = more potential traffic. Higher CPCs = advertisers are willing to pay more for the keyword. Higher competitive density = more competitors are bidding on the keyword. All of this put together equals commercial intent! This view will show you all the keywords your competitor is ranking highly for, but you are not. These are immediate areas of potential growth. Click on one of the common keywords and identify which content they are using to rank for it. Click through to the post and analyze the content. Are there any glaring signals pointing to why this piece ranks and your's doesn't? Number of referring domains/ backlinks? Take these insights and start re-optimizing your existing competing content to gain quick wins in the SERPs. Sort by competitive density to uncover low competition keywords you’re competitors are ranking for highly. Re-visit your on-page optimization and link building strategy to see if there are opportunities to improve content. You can climb the rankings for low competition keywords very quickly with a couple quality backlinks and some basic on-page optimization. Sort by CPC to find high commercial intent keywords that you can use to attract more bottom-of-the-funnel traffic. Sort by search volume to find keywords that are bringing your competitors a lot of traffic from the SERPs. Often, you'll come across several keyword you had never considered, but could easily be ranking for. #10: What About All The Keywords You've Completely Missed? OK, so you’ve found a ton of keywords that both you and your competitor are ranking for and identified which keywords have commercial intent and will be relatively easy to rank for. But, what about the uncommon keywords? The keywords your competitors are ranking for, but you’re completely overlooking. You will see a Venn diagram that visualizes the share of keywords each domain has in common, as well as keywords unique to each website. Click on the section of the diagram that contains keywords exclusive to your competitor. In a matter of seconds you've managed to uncover loads of new keywords you might not have ever thought to target. Sort by search volume, position and competition. This will give you a boat load of new high volume/ low competition keywords you can target with content, rank quickly and use to drive new traffic to your site. Google Analytics used to show a breakdown of all keywords you ranked for. This was great. It allowed you to see exactly which terms were driving the most traffic to your website (and even individual web pages). Unfortunately, Google switched to a keyword “not provided” model a few years back, so now this data is pretty much hidden. However, by linking your Google Analytics account with SEMRush, you can regain access to this data. Go to Projects > Add New Project. Enter your domain + name your project. Choose “Organic Traffic Insights” from the list of options, then click “Set up”. You’ll now need to connect your Google account and select the appropriate property within your account. NOTE: SEMRush will also give you the option to choose a database (e.g. United States, United Kingdom, etc.) + device (desktop/mobile) that you want to see data for. You should then see an “Organic Traffic Insights” report, which shows the number of keywords each page ranks for (note: this data is pulled from both the SEMRush database and Google Search Console). Click one of these numbers to reveal the keywords for the page. Not only does this uncover the exact keywords each page ranks for, it also tells you which position you rank, the keyword volume, and the % of traffic each keyword drives (note: this is an estimate). Add a positions filter to show only the keywords you’re ranking for in positions 5-10. These are great keywords to target. Why? Because you’re already ranking on the first page. With a bit of a boost, you should be able to push them into the top 5 positions and drive a ton more traffic. It’ll probably just be a case of doing a bit of on-page optimization and building a few links. Google has stated that almost 60% of searches take place on a mobile device. But did you know that Google will also often rank keywords in different positions on mobile vs. desktop. This means that a #1 ranking on desktop doesn’t always translate to a #1 ranking on mobile. You can use the mobile vs. desktop reports in SEMRush to glean additional insight into how your website — or a competitor’s website — is faring on both desktop and mobile. For example, let’s take a look at my website (i.e. 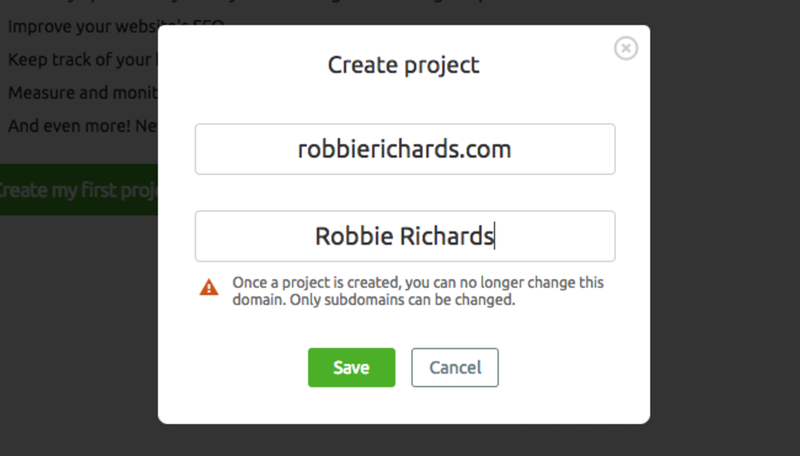 RobbieRichards.com). Within the Positions report, you can flick between Mobile/Desktop to see the # of keywords the website is ranking for, the amount of traffic it gets, and the est. traffic cost for both mobile and desktop. Right away, we can see that although my website ranks for thousands more keywords on desktop, it actually gets more traffic from mobile. We can also see exact rankings between mobile vs. desktop for specific keywords. That’s #2 on desktop, #1 on mobile! It’s not unusual for these to be a slight variation between desktop and mobile rankings but, in my experience, a big difference may indicate that your page isn’t optimised very well for mobile. You can check this using the SERP preview tool in SEMRush. This will show you how the page looks in the SERPs on either mobile or desktop. If you notice any large discrepancies between mobile and desktop rankings, or notice that your website doesn’t look great on mobile/desktop (according to the SEMRush SERP preview), it’s worth checking on an actual mobile device to see if the page is well-optimised for mobile. #13: What Are Your Chances of (Realistically) Outranking the Competition? You've found dozens of potential keywords to target. But, what are the chances of actually ranking for them? The last thing you want to do is invest a lot of time, money and resources into targeting keywords you might not ever rank for. The Semrush Keyword Difficulty Tool allows you to simultaneously assess the level of competition for a large batch of keywords. This can save you a lot of time filter excel spreadsheets and manually review keyword competition within the Organic Search Position reports. Next, enter a list of your target keywords. I’m currently using the PRO plan so I can test up to 100 keywords at a time. Once you’ve entered your keywords hit “Show Difficulty”. Basically, the higher the keyword difficulty percentage, the more difficult it will be to rank for those keywords. NOTE: If you click on a keyword, it’ll take you to the KW overview report, which will tell you which of your competitors are already ranking for that search term, along with the corresponding URL(s). If you want to see volumes / difficult scores for other countries (e.g. UK, Australia, etc. ), simply select an alternative country from the toggle at the top of the page. Copy and paste a list of your target keywords into the Keyword Difficulty Tool to determine how hard it will be to steal your competitor’s position in the SERPs. In general, I would recommend targeting keywords with a difficulty percentage at or below 40% to start. With a solid SEO and content promotion strategy in place you can target and realistically rank for these keywords pretty fast. Export and filter the results to only include those keywords with a difficulty rating at or below 40%. As your site gets more traffic and links, the authority will grow and you'll be able to start targeting higher difficulty keywords. The Organic Position Changes report removes the manual work associated with comparing a domain's keyword report from the current month to the keyword report from last month in order to find new, lost, improved and declined keywords. Sort the list by “Position Difference” to see which keywords have shown the largest ranking improvement over the last 30 days. Check out the search volume and landing page URLs for relevant keywords to see how competitors are targeting each search term. Most people think that in order to grow traffic they need to immediately start investing more time and money into things like content production, ad campaigns, guest blogging and other areas. It’s not necessarily the best place to start. You can get QUICK traffic gains without spending money on ads or writing any new content at all. Derive more value from your existing assets. I run a lot of paid search campaigns for clients across a wide range of verticals. Everything from real estate to agriculture to dentists to marine electronics. SEMrush is one of the first tools I use to start planning out my campaigns. It allows me to see which keywords my competitors are bidding on, where they rank, as well as the ad copy and destination URLs they are using to increase quality score and conversions. Here are a few reports you can use to beef up your ad campaigns and make your dollars do work! Before we can analyze and learn from our top PPC competitors, we first need to identify who they are. You could start typing in a bunch of keywords into Google and see which companies are buying ad placements. But, this would take you a LOT of time. Instead, fire up Semrush and enter your domain into the search bar. Click on any of the bubbles to be taken to Paid Search Overview for the given domain. Competition Level: higher number of common keywords = higher competition level. Ads Keywords: the number of keywords your competitors are bidding on in paid search. Ads Traffic: how much traffic the paid ads are sending to your competitors’ site. Ads Traffic Price: how much your competitors are spending each month on their paid ad campaigns. You'll arrive on the "Paid Search Positions" report. There are a number of high-level indicators you can get from this preliminary analysis. For example, if your competitor is bidding on more keywords but seeing a lower traffic cost, this could tell you two things. First, the competitor is trying to scale their PPC efforts by bidding on more keywords. This could indicate they are getting a positive a ROI from their campaign. Dive deeper. Second, if traffic cost is decreasing while number of keywords is increasing this could indicate the competitor has a well optimized PPC campaign in place. Typically, higher quality scores equate to lower CPCs. Pay close attention to ad copy and landing page experience (more on that soon). Similar to the Organic report, this domain comparison chart will show you all the keywords both you and your competitor are bidding on in paid search. You'll be able to see which paid keywords the competitor is outranking you for. Do they have a larger ad budget? Is competition driving up the average CPC? How well optimized is their ad copy and landing page experience? Are they using custom campaign landing pages? Look for areas of improvement within your own ad campaign. You'll notice the page is optimized for the target keyword, there is loads of social proof, a phone number to contact the support team and form to start a free trial. How does your ad copy and landing page experience stack up? This will return a list of all the common keywords sorted from highest to lowest search volume. This is a quick way to find all the high-traffic keyword opportunities you are not taking advantage of. You might need to increase your keyword bids or optimize your ad copy and landing page layout to improve your quality score and rankings. This sort the keywords from lowest to highest level of competition. This will not only give you a quick over view of the overall keyword competitiveness, but sometimes it will reveal some new low competition keyword opportunities you might not have previously though of. This is really helpful if you have a small PPC budget because typically lower competition keywords have MUCH lower CPCs. Your competitor's PPC campaign will be changing constantly. Get updated when your competitors target new keywords or launch new ad copy. Target ads when your competitors are losing visibility. Optimize and improve your ad's relevance by monitoring when your competitor's update landing pages. You can see the main navigation markers at the top of the report (above). New Keywords show all the keywords your competitor that are triggering your ads that previous weren't. Lost Keywords show all the keywords where your competitor has fallen out of the rankings. The Improved and Declined Keywords report will show all where your competitors are gaining and losing ground in the paid ad rankings. You should always be on the look out for new opportunities to increase traffic and sales from paid ads. This report makes it easy to find opportunities and identify low-performing keywords before you spend a ton of time and money running A/B tests. These insights could generate new campaign and product development ideas. Sort the report by "Position Difference" to see which ads have improved the most. This can usually be attributed to an increased budget. If your competitor is bidding more on the keyword it might be an indication that particular keyword is converting well and might be one you want to incorporate into your own campaign. 3. The "Declined Keyword" tab will show all the ads that have decreased in position. Typically, a large decrease in rankings will indicate your competitor has stopped bidding on those keywords. This is usually a sign that it was an underperforming keyword with a low conversion rate. This kind of insight can save you a lot of time and money running different A/B tests. This report will show you all the ad copy your competitor's are using in an aggregated report, along with all the keywords triggering the ad copy. 1. Headlines have the greatest impact on whether someone reads an article, opens an email, or in this case, reads the rest of your ad. What type of headlines are they using to capture attention? Brand mentions to reinforce trust? By modeling the headline formula of your top competitors you can quickly capture more attention, boost your CTR and increase overall quality score. This will help lower CPC and drive more traffic to your landing pages. 2. The next step is to look at the description copy. Are your competitor using alpha numeric numbers to standout? What type of offers are they using to draw the click? What CTAs are they using? 3. Display URLs can have a big impact on the relevancy and CTR on your ads. Look at patterns across your competitor's ads. Are they using keyword rich display URLs to boost quality score? Do they using dynamic keyword insertion to increase relevancy? Do they using product names in the URL? Look for new keyword opportunities and see how well each ad is ranking. You can export and sort the data to find new low competition/ CPC keywords to target. Don't spend loads of time and money testing ad copy and keywords. Instead, let your competitors do all that heavy lifting while you reap the rewards. Enter the “Ads History” report. It allows you to determine when, and how often your competitors bid on each keyword. If you notice that your competitors have bid on a particular keyword over a long period of time, you can reasonably infer it is a profitable keyword. You can also uncover which ad copy is performing best by looking at the historical data. Go to Advertising Research >> Ads History and enter your competitor’s domain. If the cell is filled blue then your competitor was bidding on the keyword that month. The keywords showing blue for each month are likely high performing since they have chosen to bid on them for over a year straight. This provides insights into the different types of ad copy your competitors have been testing. If you notice they have used the same ad copy for a long period you can predict that this ad copy converts well. Conversely, if you notice that your competitors tried certain ad copy and then quickly changed it the next month, then it must not have performed well. You can use your competitors historical ad data to optimize your own ad copy and keyword bids without having to spend a lot of money testing. Enter your competitors domain into the Ads History report and look for trends. If your competitor has bid on a specific keyword or ran the same ad copy for a long period of time, it likely converts well. You might want to replicate some of their ad copy and bid on those keywords. If you notice that they bid on a certain keyword for a few months and then discontinued, you can determine that keyword did NOT perform well and elect to remove it from your paid keyword list. If you sell products online you probably have product listing ads running through Google’s merchant center. SEMrush recently launched the “PLA Positions” report. PLAs typically have the highest CTRs, and in my experience, conversion rates. This can be attributed to the top-of-page ad placement and visual real estate they occupy in the SERPs. Plus, they are positioned more for bottom-funnel traffic. This report is great for analyzing the pricing strategy of your top competitors. You can also use this report to obtain some inspiration for product titles for your own (similar) ads, along with landing page inspiration (just hover over the yellow “ad” icon and click the popover to view the landing page of any ad). There’s also the “competitors” PLA report - this will show you other websites that are competing for similar terms. For example, if we enter ebay.com, the “competitors” report shows us that Walmart, Jet.com, and NewEgg, amongst others, are competing for many of the same keywords. Competition level - this shows a visual representation of how similar this website is in terms of PLA competition. Common keywords - the number of keywords this website has in common with the website you entered. PLA keywords - the total number of PLA keywords the website is bidding on. Paid traffic - the amount of paid traffic they’re getting from these ads. Paid traffic price - an estimation as to the amount they’re spending on PLA ads each month. Enter five of your top competitors into the “PLA Positions” report. Make a note of your competitor’s pricing strategy. Sort the PLAs by position. Click through to the landing pages of the top ranking ads and see how they have optimized the landing page experience. Do they incorporate keywords in PLA title, landing page headers and body copy? YouTube has over one billion users and is the second largest search engine on the planet. The number of people earning six figures a year from their YouTube channel is up 50% year over year. And, all of the top 100 global brands have run some kind of YouTube ad in the past year. Videos ads are an important consideration in any paid search campaign. Use the Video Advertiser Overview report to find out how many video ads your competitor is running, across how many different channels and within which specific videos. Quickly see which landing pages have been promoted the longest, and which ones are receiving the most traffic. You’ll also be able to see how long competitors have been targeting each channel, the number of subscribers and percentage of videos on each channel that provide ad placement opportunities. What type of videos are they using to promote their products or services? Pay attention to the video messaging – is it funny, serious or controversial? How long is the video? What type of CTAs are they using to drive traffic or capture conversions? Look at the number of times the video has been seen. This is usually an indication of how aggressively the video is being promoted across other channels. The video shown above has been seen over 10,000 times. This suggests Microsoft has been promoting this campaign for a relatively long period of time. In some cases, this could indicate a high-converting video ad and give you some ideas on how to position your own video ad content. Find out where your competitors are sending video ad traffic. Pay attention to the conversion goals. Are your competitors capturing emails? Selling a product? Promoting an affiliate? In the example above, you can see Microsoft is using video ads to promote a campaign asking people to vote for non profits making a difference in the world. Analyze your competitors landing pages and look for opportunities to better optimize your own. Are they using social proof? What about value proposition and benefit statements? Product images? Sign up forms? Free trials? Special offers? Find out where your competitors have been promoting ads the longest. This is where you will want to launch your first ad placements. 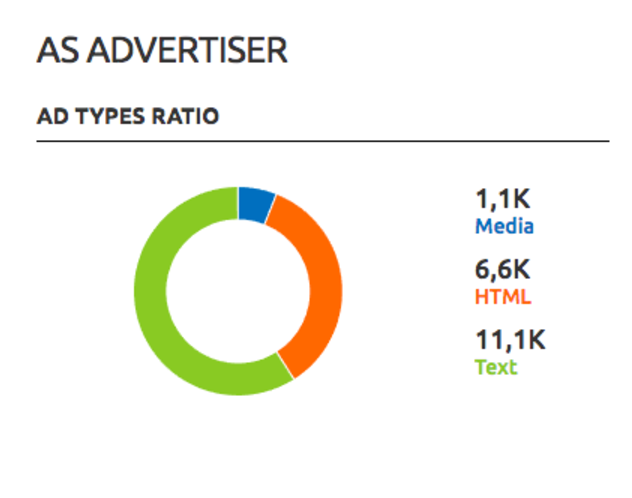 NOTE: The Display Advertising report is currently in beta. Although the data is not complete yet, the report still provides a handy overview of your competitor's display campaign activity. You'll be able to see if the competitor is advertising on Google's on display network, publishing ads on their own site to monetize traffic through AdSense, or both. I can also see they are mostly displaying text ads. In the “publisher's” report, you can even see exactly where the website is advertising, and exactly how many ads appear on that domain. If you click the “ads” hyperlink, you’ll even be able to see the exact ad copy used on that website. And it doesn’t end there...on the “landing pages” report, you can see the landing pages the advertiser is directing their ads to. This is insanely useful for figuring out what type of offers are converting for your competitors. Is your competitor an advertiser, publisher or both? Is your competitor showing ads on more sites? If so, this could indicate the display campaign is performing well. Are the number of publishers decreasing? This could indicate one of two things. Either the campaign is not delivering a good ROI and the competitor is cutting back investment in display ads, or they are excluding under-performing placements and building a more targeted campaign. Filter the report to identify which ad creatives have been in rotation the longest. Usually this will indicate a high-performing display ad you can model in your own campaign. Take note of trends for each different ad type. This will help provide a little more context to Publisher graph shown above. Look at how many ads are being promoted on each site, whether they are text or image based, and for how long ads have been seen on the site. The longer your competitor has been placing ads on a site could indicate it might be one to consider testing as a target placement in your own display campaign. Look at the "Times Seen" and "Ads" columns to get an idea which landing pages are being targeted the most. If you’re a blogger driving solid traffic and are open to on-site advertising, this section is for you. There are many sites out there paying for the traffic you are driving through organic search. So, if you were able to identify those sites and offer them advertising on your site, you could quickly start to monetize the traffic. Semrush makes this SUPER easy. Go to Organic Research >> Competitors and enter your domain. Pay attention to “Ads Keywords” column. Look for competitors that are bidding on the keywords you are ranking for. In this example I would click on the “Common Keywords” metric next to Sproutsocial.com. Semrush is a great place to source partnerships with companies that are bidding on the keywords you rank organically for. Reach out to some of these companies and see if they are interested in placing ads on your site. This can be a win-win, especially if they are spending a lot of money on the keywords you rank for. Negotiate an ad fee and start monetizing your organic traffic. Nothing is worse for SEO than having toxic backlinks pointing towards your website. 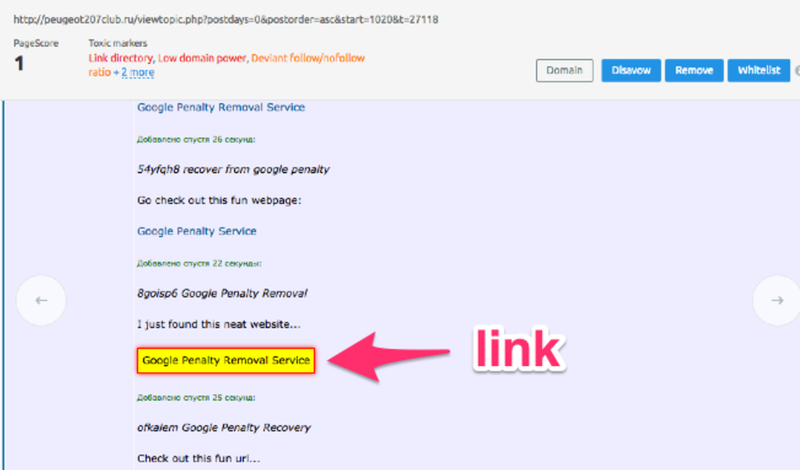 Bad backlinks can even lead to a Google penalty (if not disavowed). Luckily, SEMRush has a built-in backlink audit tool that analyses your backlink profile for toxic backlinks at the touch of a button. First, you need to add a project within SEMRush — you can then click the “Backlink Audit” option. It will then walk you through the setup. I recommend going through the 4 options and adjusting them accordingly. Once you’re set up, hit “Start Backlink Audit”. As you probably guessed, a “low” toxic score + a low number of toxic backlinks is good. However, there are a couple of potentially toxic backlinks, so let’s take a look at the full “Audit” report. By default, it lists the backlinks in order of toxicity (highest first) so you can easily uncover those harmful links. In this instance, we can see a couple of websites with relatively high toxicity scores. Click the link to view the page and view the link. Here, we can see that this is most definitely a spammy link. It’s a Russian forum of some sort, and my link clearly doesn’t make sense in the context of the page. This needs either removing or disavowing. In the top right-hand corner, you can see a few options to either “disavow”, “remove” or “whitelist”. “Disavow”: Adds the URL (or domain) to a disavow file. “Whitelist”: Add the URL (or domain) to a whitelist; this is useful if you feel SEMRush made a mistake in it’s toxic analysis of this link. Whitelisting will ensure SEMRush doesn’t grade links from this URL/domain as toxic in future. In this instance, I think “disavow” is the best option. Click the “disavow” button and it’ll be added to the disavow tab; you can then upload your disavow file (from Google) and SEMRush will add the link to it automatically. You can then submit this directly to Google. Enter the SEMRush Link Building Tool. Enter a list of target keywords + competitors and let SEMRush work its magic! Reach out and secure the link without ever leaving SEMRush! Go into one of your projects and select the “Link Building” option. Note: If you haven’t already set up a project within SEMRush, you will need to do this first. Next, you’ll be prompted to add up to 10 keywords you want to earn high rankings for. And up to 10 competitors. Then click “Start Link Building”. Basically, SEMRush has done all the hard work for you and found thousands of link prospects (that it thinks are a good match for your website). They look at 50+ factors to determine these prospects, so they’re usually pretty damn good! Anyway, all prospects are given a rating out of 5. You can also see a bunch of other data for each prospect. Some of this data is crazily useful! For example, there’s a “complexity” rating, which tells you how difficult getting a link from this website is likely to be. There’s also a “Trust Score” and many other ratings related to domain health. This allows you to make decisions FAST. Basically, all you have to do is to sift through the prospects, pluck out the ones you want to pursue, then use the drop-down to select an appropriate outreach strategy. 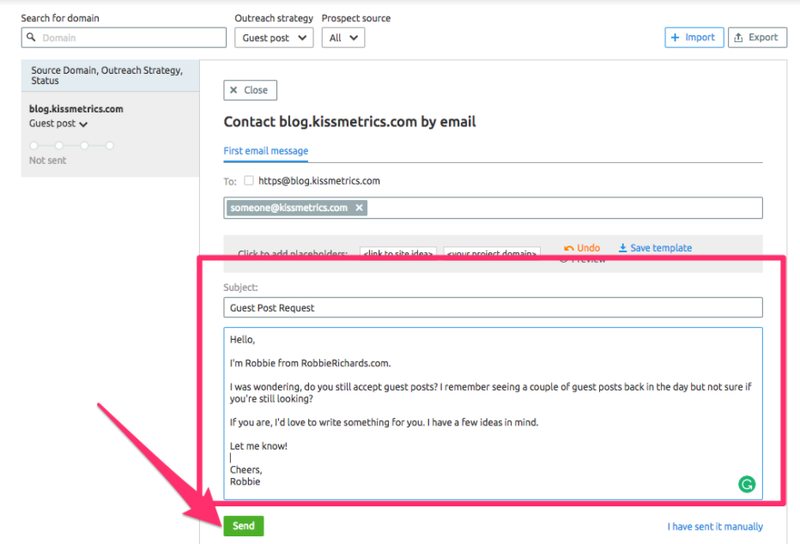 I know KISSmetrics accept guest posts from time to time, so I’m going to opt for guest post outreach in this example. To do this, I simply click “Add with” and select “Guest Post” from the drop-down. The prospect will then be moved automatically to the “In progress” tab — this is where you can begin (and manage) your outreach! Starting outreach for this prospect is as simple as hitting the “Send” button. This will bring up an email composition area where you can craft the perfect message and send the outreach email. Hit “Send” and the outreach is complete! This saves a ton of time when compared to exporting data to third-party tools! 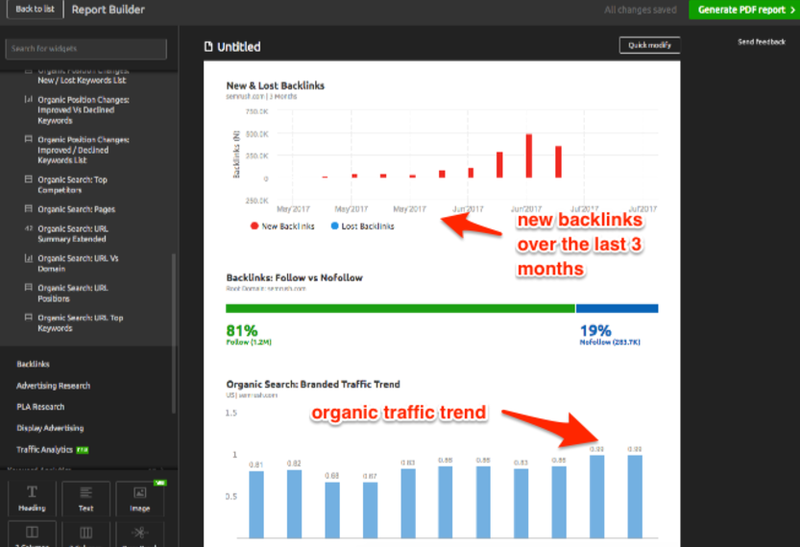 Semrush provides the capability to analyze your competitor backlinks profiles. You can can uncover the number of backlinks, referring domains, follow/no follow and top level domain distribution. These features can help you better understand your competitor’s link building strategy and highlight new sources you can tap into to build backlinks and referral traffic. Pay attention to the number of referring domains. This is a strong indicator of the diversity of your competitor’s link profile. A large number of relevant referring domains will boost a site’s overall domain authority. Another piece of data you’ll want to look at is the type of backlinks your competitor is getting. As you can see in the graph on the previous page, over 97% of Backlinko‘s backlinks are “text” links. This is another indication of a killer backlink profile. The site likely has a large number of contextual backlinks. Backlinko also has quite a few .org backlinks. ​Backlinks from these TLDs will typically pass more authority onto your site. From the Backlinks Overview page, click on the “Referring Domains” metric. Brian has nice list of high PR domains linking to his site, including a healthy mix of net, .org, .com TLDs. You can also see how many backlinks are coming from each domain. Look closely at the type of sites linking to your competitor. In this case, it looks like Brian is active on forums such as Warrior Forum and Inbound.org. These are communities you could start engaging in to drive ﻿traffic to your site. He has 46 backlinks coming from Scoop.it. This could indicate that he is leveraging the social channel to promote his content. Backlinko is getting links from AllTop indicating that he may have submitted his domain to the directory. Smart move. AllTop provides authoritative backlinks for hundreds of different business categories.Use these insights to guide your own content and link building strategies. Now, it’s time to see which specific pages are linking. This show you exactly how they are getting their links. Are they using guest posts, forum marketing or directory submissions to build links and drive traffic? 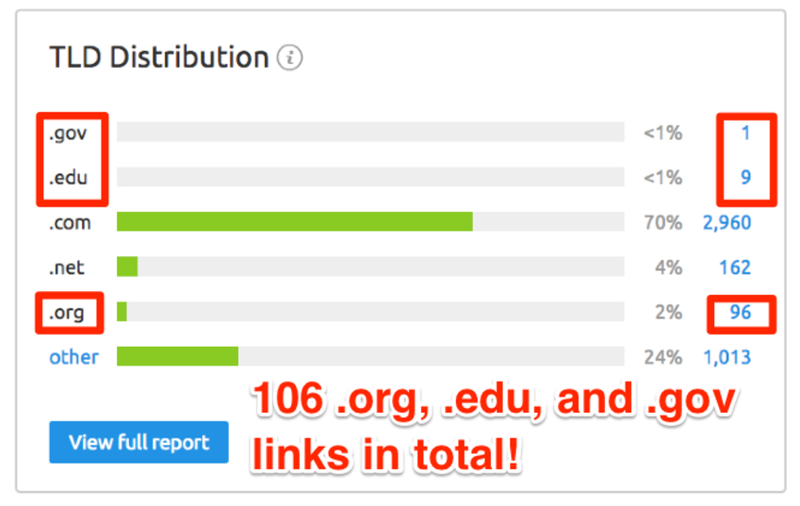 Click on the “Total Backlinks” metric. Other useful metrics including the anchor text and number of other external links pointing to your competitor’s site from each referring page. You can also see if the links are follow/no follow. One thing to note here is that Backlinko has a nice mix of brand, keyword and naked URL anchor text. But, how the heck do you extract actionable insights? I might want to see how Brian is getting his .org backlinks, since these are powerful links. This will return a list of only those .org sites linking to the domain. See if there are any backlinks you can replicate in your own link building campaign. How would like to know which specific pages on your competitor’s website are attracting the most links? Go to Backlinks >> Indexed Pages. Sort the domain column to return results in descending order. Backlinko’s list of Google ranking factors has attracted the most referring domain backlinks. If you’re in the SEO/link building space, you instantly know that content targeting this subject could be used to build links and traffic. Take a look at which of your competitor’s posts/pages are generating the most backlinks. This will give you an idea of the types of linkable content you can incorporate into your own content strategy. Explore the content in depth and see if there any opportunities to expand and make it better. This insight forms the foundation of my content promotion strategy. Enter your competitors domain and check the “Indexed Pages” report to find which posts and pages are attracting the most backlinks and referring domains. Click the referring domains link and see how different sites are linking to your competitor’s content. Are your competitors building links from guest posts, roundups, resource pages, blog commenting…? OK, let’s assume you’ve looked through your competitors backlinks and identified a bunch of websites they’ve written guest posts for. But, how do you know which one of these websites has the best traffic potential? And how do you know which website will give you the most powerful link(s)? Quick Batch allows you to quickly compare up to 200 URLs. It kicks back a bunch of metrics on one screen that will help you to make decisions...FAST. For example, I pasted a few guest posts by Brian Dean (AKA. Backlinko) into the Quick Batch tool and selected “Root domain” under the Results scope dropdown. If we order by Domain Score, we can see that getting a guest post on Ahrefs.com will probably result in the most powerful link, closely followed by Noah Kagan’s OKDork.com. 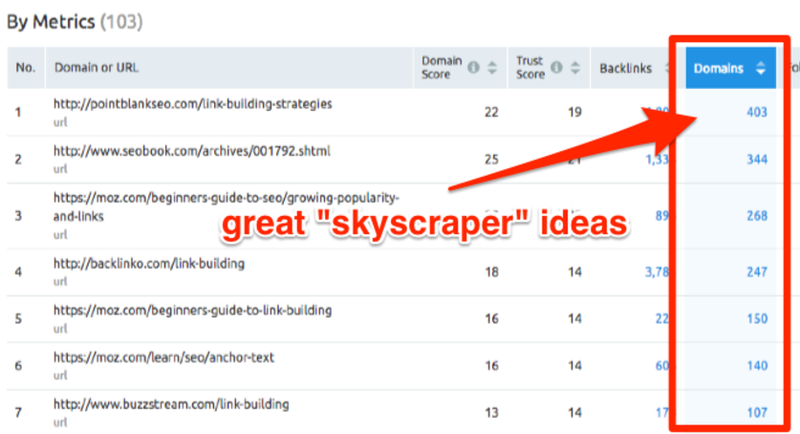 You can also use the Quick Batch tool for finding “skyscraper” content ideas. Let’s say you have a list of URLs from a bunch of different websites (maybe you scraped Google SERPs for a term like “link building”. Paste these into Quick Batch, select “URL” under the Results Scope option, and then order by “domains” to uncover the pages with the most referring domains. Paste in a list of URLs into textbox (one per line). Order by the metric you’re interested in (e.g. “domains” when researching potential “skyscraper” content ideas). Finding competitors can be somewhat difficult, especially if you’re new to an industry/niche. Luckily, SEMRush has a comparison tool that allows you to do this in seconds. First, enter your domain (or that of a known competitor) then navigate to the “comparison” report. You should now see an overview of the domain you entered, along with 5 “add competitors” boxes. But, like I said, what if you don’t know who your competitors are? Don’t worry. As soon as you click inside one of these “add competitors” boxes, SEMRush will actually suggest competitors for you. SEMRush will now show you how your domain compares to that of the competition. Pay particular attention to the graph, as this shows new backlinks over time. If you see one of your competitors have attracted a bunch of backlinks just lately (as ahrefs.com has in this example), this probably indicates that they’re doing something right in terms of link building. Below this, there are some stats showing how the domains compare. Here you’ll see referring domains, backlinks, domain score, and much more. Use this to glean deeper insights into your competitor. Enter your domain (or the domain of a known competitor) into SEMRush. Go to the “Comparison” report. Add competitors (either manually, or using the suggestions from SEMRush). Look for competitors that are actively building backlinks, then investigate further. There is likely a lot you can learn from them, such as what type of content is attracting the most backlinks, what type of backlinks they’re attracting, and so forth. It can be difficult to see exactly how you stack up against the competition. 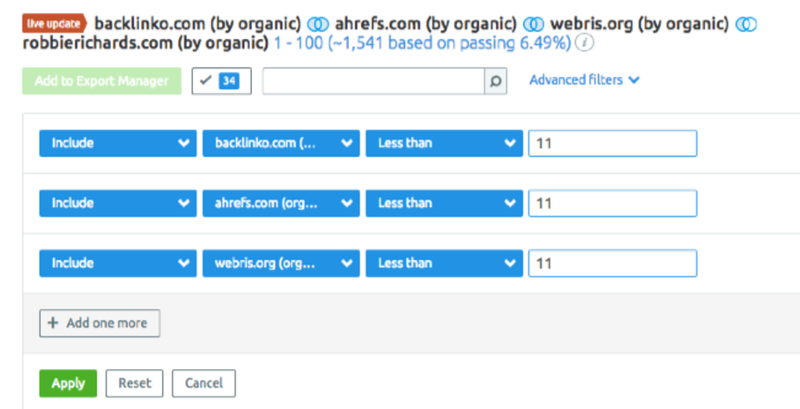 The Semrush “Domain vs. Domain” report makes it easy to analyze up to 5 competitors at once, across both organic and paid search channels. This can help you build high performing organic and paid search campaigns based on your competitors most successful keywords, saving you a lot of time and wasted ad spend. Go to Backlinks >> Domain vs Domain. You’ll see how each domain is ranking for common keywords. By clicking on different intersection points within the venn diagram you’ll be able to view common and unique keywords, as well as the keywords your competitors are ranking for but you are NOT. What if you’re setting up a new campaign and don’t know where to start? You’ll be able to see where each competitor ranks for the search term, find out search volume and assess the level of competition for each keyword. This remove your keywords from the report and leave you the unique keywords of the three competitors you’re missing. Export the search terms and sort by level of competition to find new low-competition keyword opportunities to target in your search campaign. The Domain vs. Domain tool can also help you save money by identifying the keywords you are bidding on in AdWords, but already rank for organically. Next, filter the list of keywords to only show those ogranic keywords ranking in the top 3 organic search positions. Statistically, keywords ranking top 3 in organic search get the same, if not more traffic from the SERPs than top ranked PPC keywords. The “Charts” tool is great for producing quick data visualizations for up to five different domains. You can represent the data in a line, bar and pie graph format. Export or print the graphics as a PDF for reporting. Is your competitor increasing or decreasing their ad spend? Are they running seasonal ad campaigns? Above, you can see that towards the end of 2015 Southwest was spending less on paid traffic, but getting more traffic. This indicates a highly optimized ad campaign that is generating the most traffic for the budget. If your competitors are showing similar trends, it could be an ad campaign worth analyzing further and potentially modeling. Use the Charts tool to gain insights into the historical performance of your competitors organic and paid search campaigns. Drill in and look at which new keywords your competitor is targeting. Are there any opportunities you may have overlooked? Identify related keywords and test them in your campaign. The Charts Tool is also an easy way to see how your competitor’s organic search campaign has been performing over time. Are they ranking for more keywords? Are they getting more organic traffic? We can see here that Helpscout has seen a consistent increase in organic traffic over the last three years. If I was in the customer support/ helpdesk industry, I’d definitely be looking closely at their search strategy very closely and looking for ways to model their success. You can even use the Charts Tool to win new clients. For example, let’s pretend I am trying to convince Kmart that they need more help with their SEO efforts. If tables and excel spreadsheets aren’t your thing, use the Charts tool to get a quick visual snapshot and identify competitors you might want to analyze further. Semrush is continually adding new featured to it’s already powerful competitor research platform. On top of in-depth SEO, PPC and backlink analysis, users can now use it’s new Site Audit tool. Enter your domain and set up any of the advanced crawl settings. You can select which user agent you want to crawl the site, exclude certain URLs and parameters, as well as schedule recurring reports highlighting the health of the website and areas for optimization. In minutes I’ve been able to identify dozens of issues on my blog. You can export these reports as a PDFs to pitch potential clients and build reports. Google makes minor algorithm updates on an almost daily basis, meaning the SERPs can be pretty volatile. However, the SERPs are more volatile on some days than others. They’re also more volatile for certain industries over others. This is important to know. SEMRush sensor shows the volatility of the SERPs over the last 30 days. This is great for seeing how your website compares to the rest of the web. Plus, it can also be useful for spotting algorithm changes. You can even drill down into various categories to see how the SERPs are faring in different “niches”. However, this is pretty standard. Why? Because sports-related queries often require fresh results, such as current scores and whatnot. Google, therefore, moves websites around in the SERPs a LOT. Anyway, getting a general sense for SERP volatility is one thing, but this doesn’t really tell you much unless you can see how your website is faring in comparison. Luckily, this is exactly what the “Personal Score” tells you. It basically looks at the keywords you’re ranking for and checks SERP volatility for them. I usually check this periodically and, if I see that my Personal Score is much higher than the average for my niche (i.e. the “Internet and Telecom” category), I’ll investigate things a little further. Keyword rankings form the foundation of any SEO or PPC strategy. The higher you rank in the SERPs, the more traffic and potential customers you will drive to your website. Keeping track of where you rank for target keywords is very important for measuring campaign performance and identifying areas of opportunity. But, it can be extremely time consuming to manually enter search terms to monitor your progress in the SERPs, especially if you’re targeting hundreds or thousands of different keywords. Enter the Semrush “Position Tracking” report. This allows you to monitor national, regional and local search rankings for any domain or keyword, across any device – mobile, tablet and desktop. You’ll be able to monitor weekly changes in a website’s search visibility and track movement for individual keywords. If you rank #1 for every keyword you are tracking, your search visibility score will 100%. 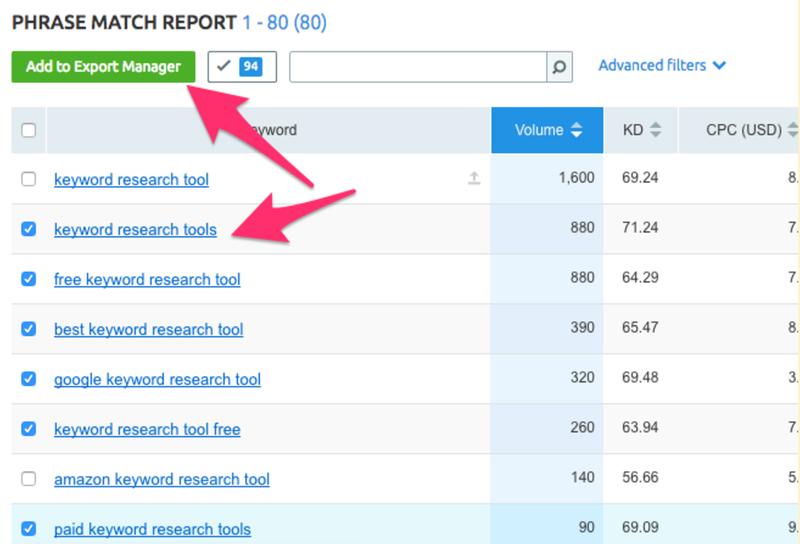 The keyword grouping feature makes tracking thousands of search terms a breeze. You can group them by specific keywords or brand names. Each keyword can up to 5 difference tags and be housed in multiple groups. Export the data to excel or PDF to use in client reports. An essential part of any marketing is measuring performance. For a lot of companies this comes as a monthly report highlighting metrics such as organic traffic increase, new keyword rankings, PPC traffic and more. Select the report widget from the left menu, enter the domain URL and select the device type. You can also drag-and-drop heading and text blocks to organize data and add commentary to key metrics in the report. Use the layout widgets to create columns. Let’s assume we were doing SEO for SEMRush. A visual representation of new links being built over the last 3 months. Looking to attract more SEO clients? Don’t worry, SEMRush has got you covered! Enter the Lead Generation Tool. You’ll then be free to follow-up on the lead and offer your SEO services. Go to the Lead Generation Tool, fill in your details, then copy/paste the widget code onto your website. You can edit/customise the widget beforehand — just adjust the settings on the Lead Generation Tool page accordingly. Some of you may be wondering how Semrush collects its data, despite Google’s move to “not provided” keyword encryption. So, I did some research and found an answer. Rae: You offer estimated traffic data for sites. How do you determine how much traffic a site is receiving without access to their analytics? Additionally, You offer a listing of keywords you (SEMRush) believe drive traffic to a site. How are you identifying those keywords and how does Google’s recent move to 100% secure search (not provided) affect your ability to identify those keywords (if at all)? Black: We take a database of the top 95 million keywords worldwide and automatically query each keyword on a regular basis. Sometimes, as often as everyday, depending on the popularity of the keyword. Then, we record the first two pages of search results for each keyword and parse that source data in order to determine which domains rank for these keywords and where. Since we’re looking at Google from the outside and reflecting what we see, that’s exactly why we’re not affected by the “(not provided)” issue. In order to determine a domain’s traffic coming from organic and ads keywords, our algorithms factor in the search volume for each keyword in their report, along with their ranking position to find what percentage of the monthly search volume is going to them based strictly off of where they rank on the SERP. We do that same calculation for each keyword and then total it all up. There is a free version of the tool. However, the reporting features are very limited. Semrush has three paid plans and three pricing options. The Pro plan is $99.95/ month. If you’re an individual blogger or small agency the PRO account will be plenty. The Guru plan is designed for larger agencies. It goes for $199.95/mo. The Guru plan allows you to run 3 simultaneous sessions (multiple people can be logged in and working in the account at the same time) and run more reports and store historical data. You’ll also be able to create branded PDF reports for clients. The final BUSINESS plan is for larger agency teams (up to 10 users) who are working with a ton of data each month across clients campaigns. Outside of the increased data access, you'll also be able to white label PDF reports and get access to the SEMrush API. Semrush is my go-to tool for keyword research, PPC analysis and competitor research. I use it every day to find keyword opportunities, analyze PPC campaigns, brainstorm content ideas, and perform in-depth competitor research. At $69.95, the tool is by no means cheap, but if you act of the mountain of actionable data the tool provides, it will pay dividends in a very short period of time. And, although this review is very in-depth, I have only covered a small fraction of the tool's use cases. If you are a serious marketer or online business owner, Semrush is one of those "must-have" tools. Did you find this review helpful? Are there any ways you use the tool to get actionable insights that were not covered in this review? Robbie, This is such an amazing list to work on! Every time I read your articles or eBooks, i save ton of my time to explore anything you. You do everything what an SEO agency looks for! Thanks Satish, glad you’re enjoying the content, and appreciate the kind words! Wow. That was an incredible guide Robbie – and one that I’ll be returning to often once I’ve pulled the trigger and signed up for SEMrush. You’ve convinced me. May I ask what your other 2 top tools are? When you pull the trigger and sign up please let me know. If you have any questions along the way don’t hesitate to reach out 🙂 I think you’ll find the tool invaluable to your online marketing efforts. The favorite tool was a general reference. I’m a BIG fan of Buzzbundlefor content promotion and AppSumo tool suite for lead generation. I’m imeepssrd. You’ve really raised the bar with that. In order to get the PDF, click the blue CTA bar in the post (end of intro). It will ask for your email. Once you enter your email address and click the button the PDF should automatically download to your computer. Wow Robbie! What a review Man! There are lots of reviews there but I liked it for your unique approach and awesome insights. Thanks! Awesome, glad you enjoyed the post Miraj! Are you currently using SEMrush? I have been browsing for a proper SEMRUSH tutorial for so long. Your guide is a killer, I am using SEMRUSH for months but this is the first time I will get the most out of it. In order to get the PDF, click the blue button inside the post. You should see a popup that asks your email address. Enter your email address and the PDF should automatically download to your computer. Try this and if it doesn’t work let me know and I’ll email you the PDF. SEMRush works fine for me, and is truly a great tool for any SEO specialist that wants to achieve success online. Using their service I had access to many inside infos regarding some of my competitors and this way I found why are they so successful. Very great article! Now, I am very interested with SemRush. Use the link in the post to get a free two week SEMrush PRO trial. Follow the playbook and let me know if you have any questions. Great tutorial. After reading this post, I decide to buy SEMRush for my blog. Can you give me your affiliate link? Glad you enjoyed the tutorial, and appreciate you signing up for SEMrush through my link. Here is my affiliate link: http://www.semrush.com/?ref=14255390. 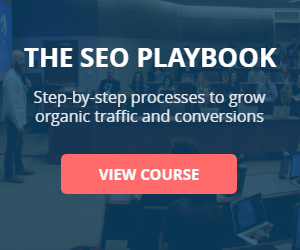 Be sure to download the SEMrush playbook too. That’ll get you off to a strong start 🙂 Let me know if you have any questions. It is awesome tutorial. But After I subscride and I cannot see any link two download The Ultimate SEMrush Playbook. Please guide me or send my email above. Semrush is really an nice tool for keyword research , competitor analysis and I have used it feeling good with this service.First I wish all to try out free trail then proceed with pro one and its worth of paying and this tool can help you to perform better more. Hey Kirshan, glad you’re giving the trial a go. It’s a great way to see if the tool is right for you. I personally use the tool every day for personal and client projects. Saves me a TON of time. Invaluable in this line of work. I just marvel at what an incredible tool SEMRush has become! 6 years ago it was just a fun little site to do a Quick ‘n’ Dirty Look-Up to spy a bit on AdWords competition. Now it just lays any domain BARE for nearly any aspect of it’s strengths or weaknesses. Thanks for the deep-dive! One aspect you didn’t get into is it’s value for quick Google penalty assessements. Especially with SEMRush recently reporting the Top 100 keywords instead of just 20 – you can spot a -50 or -100 kwd penalty at a glance now. Great point, Glenn! I’m actually in the process of updating the ebook. I add this point in there. Sure, Harshika! Here is a one month free trial link http://www.semrush.com/billing/offers/buy/xny4hprc?promo=ROBBIERICHARDS-L801U7EK. Cheers! Thanks Dev! You can actually download it as a PDF 🙂 Just click on the “ebooks” link in the main nav. I’m afraid it seems semrush is not doing a 30 day trial anymore, and being that things are a bit tight at the moment (which is why i am doing keyword research ), i will have to look at the LTP 10 day trial. so i am confused which keyword difficulty i should target 40 or 60 ??? With little domain authority you’re going to find it veery difficult to outrank DA 60 sites. At least in the short term. I’d definitely stick below 40. Oh. Great review I think that SEMrush I probably one of the best keyword research tool right now on the internet. For those who want to increase traffic to their blog or get good ranking the semrush is the tool to go for without any doubt. Agree, Rohit. It provides invaluable data for my SEO and PPC campaigns. Speaking of, I’ll be launching a full case study on how I used the tool to build a PPC campaign from scratch for a client in the health IT field, using only competitor insights. Awesome Gaurav! Any case studies or insights into how you used the tool specifically to get those results? Well to be honest I never used SEMrush and I guess its on my purchase list. Your review is really helpful. Cheers Ganesh! 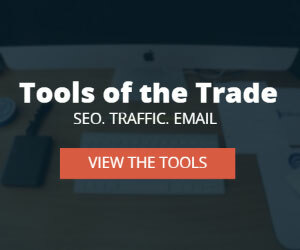 I use the tool every single day for competitor research, SEO and PPC campaigns. Robbie – thanks as ever for such great content. Just creeping into learning about keywords and your blogs and articles are always a joy to read. So informative, so clear and yet so comprehensive. Thank you indeed for being such a reputable source and helping so many. Thanks for stopping by the blog, and glad to hear you’re enjoying the content 🙂 The tools do have a solid price tag, but if you’re using them a lot they pay for themselves pretty quickly. What site are you doing KW research for? The SEMrush free trial link given is not working. Can you please update it? Which link isn’t working? Where on the page? I’ll look into it. A few of my blog visitors have complained about my website not working correctly in Explorer but looks great in Safari. I haven’t run into any issues, but know it happens. I always test first, and look carefully through the theme compatibility notes before installing. Great review. Now, I am very interested with SemRush. Nicely done robbie, but question comes when doing competitor research. Nowadays pbns links are hidden and major tools like ahref, moz not finding the pbn links. then how to find them with semrush? Then i heard that semrush got less Databases compared to majestic seo tool. Is that true? Ahrefs, in my opinion, has the best link index. Nice Blog Robbie, but you have put some outdated content in this blog. For instance Google has already closed right side ads & semrush also removed its video advertising research. Thanks Rohit! I do need to update some more info the post. Appreciate the heads up! I like reading your post. There is a table of contents, which is good. It’s too long the every article. Anyway, i purchased Semrush through your link, thanks. Great feedback, Tony! I’ll make a note of that for the next update 🙂 And, thanks for buying through the link. it’s an awesome article I never read. thanks for the very valuable information. I love the way the article is structured. Managing to pull of such a lengthy content while maintaining a good flow is an incredible task. Thanks for showing how to do it. Love to hear that, Saneesh! Do you use SEMrush? Thanks for your valuable review of SEMRUSH. It is awesome that you reviewed it by covering all the aspects. Good one. This article on SEMRush review helps me finalize Digital Marketing tool for my website. I will go with this SEMRush tool for next month and share feedback here. Thanks for the suggestion, Helen! I’m working on something like that 🙂 Will be releasing later this year. Is SEMRUSH Worth for beginners and in what terms? Hi Jacob! If you relay on keyword research, site audits, PPC analysis for client/ personal projects, then I’d say yes. It gives you a complete toolset that should pay for itself many times over each month in terms of you ability to provide more value for clients. awesome article and great review of semrush..